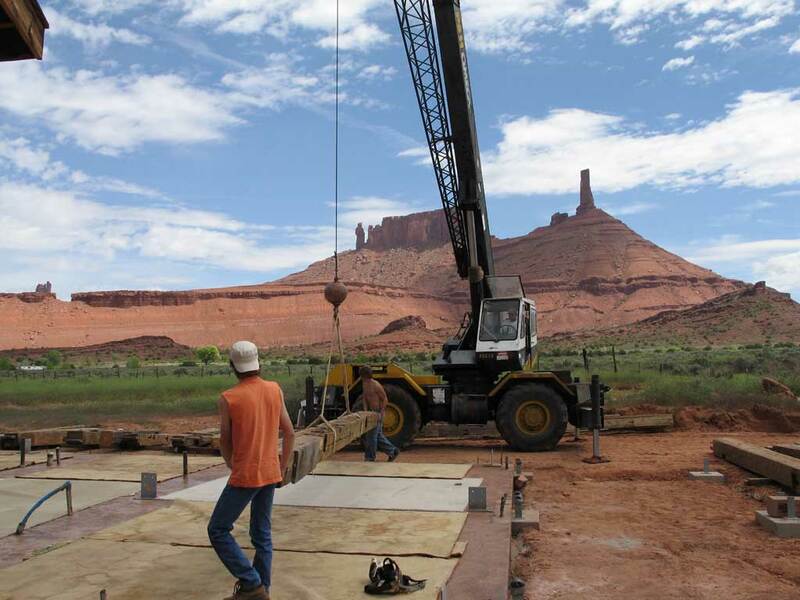 This is the owners description of his barn raising in Castle Rock Valley, Utah, in May of 2005. The barn frame was built in upstate New York sometime around 1850. The timbers are hand-hewn pine and held together with oak pegs. By coincidence, the barn was located about 30 miles from where Glenn and Tana grew up. Day 1: The pieces of the frame, which were delivered last fall, are moved into position using a crane, a forklift, and some muscle. Each piece has a tag which identifies its position in the frame. The pieces are sorted arranged so that the sections can be assembled on the ground. Days 2 - 5: The "bents", or sections, are assembled, pegged together with new pegs, and adjusted so that they are square and true. Since our building will have a 2nd floor loft, notches are cut in the tie beams to hold the floor joists. The joists are 3/4 round cedar logs from another old building, and they also need to be trimmed to length and cut to fit in the notches. Zane helps the crew push the pieces together. We have always wanted an old house - they have more soul than your average newfangled house. The problem is we have not been able to find one located in a spot we wanted to live, so we decided to build our own old house. 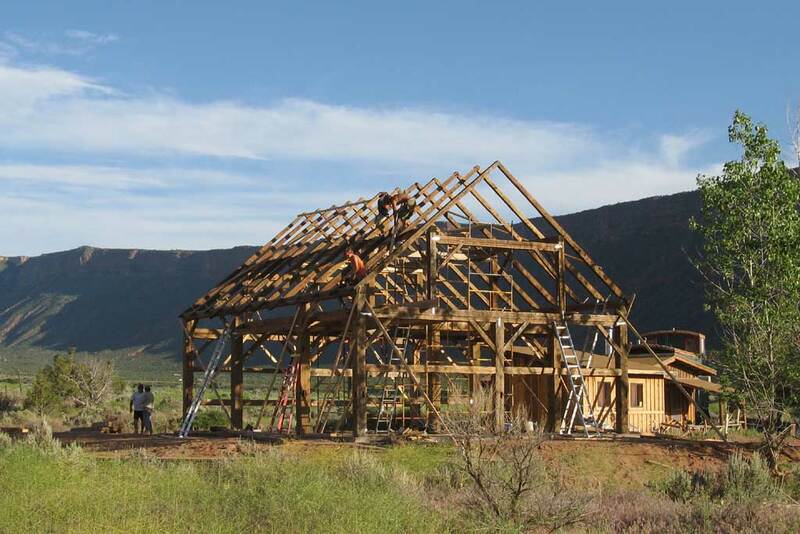 We found an old barn frame, and are using that to build an addition to our compound in Utah. 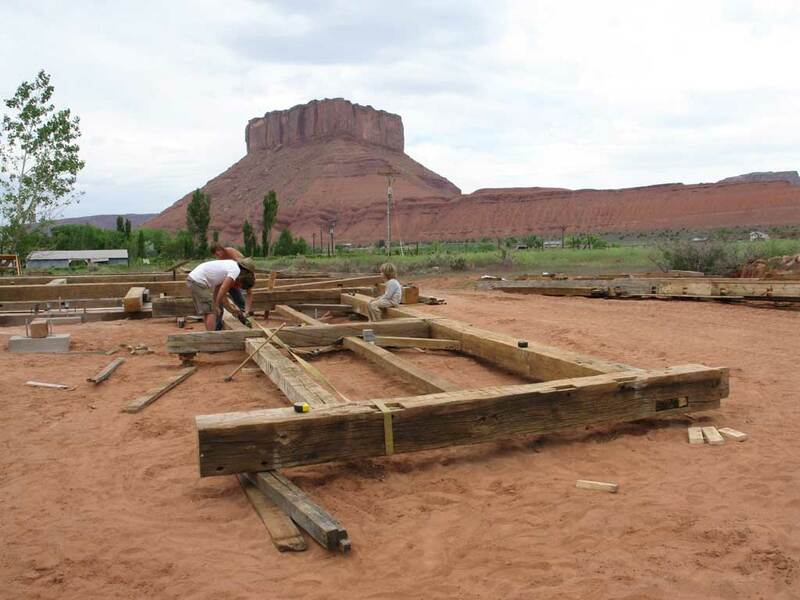 Day 6: The barn frame is ready to be lifted up and put together. 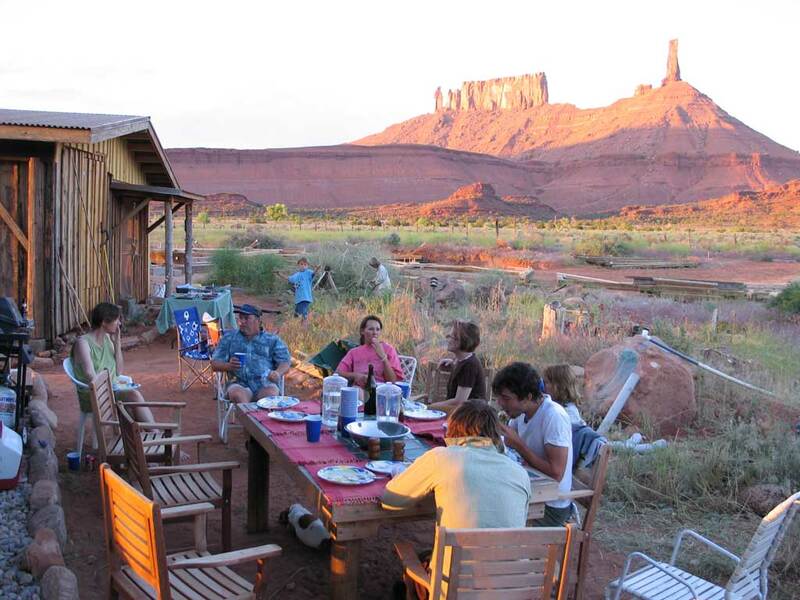 After a weekend of adventure, visiting the snow in the mountains, rafting and swimming in the swollen Colorado river, it's time for the Barn Raising Party. Everyone came except the crane operator (and his crane) - they were on a driving tour of western Colorado. Castle Valley Utah, Newcastle Colorado, whatever. Hopefully we'll have a crane tomorrow. 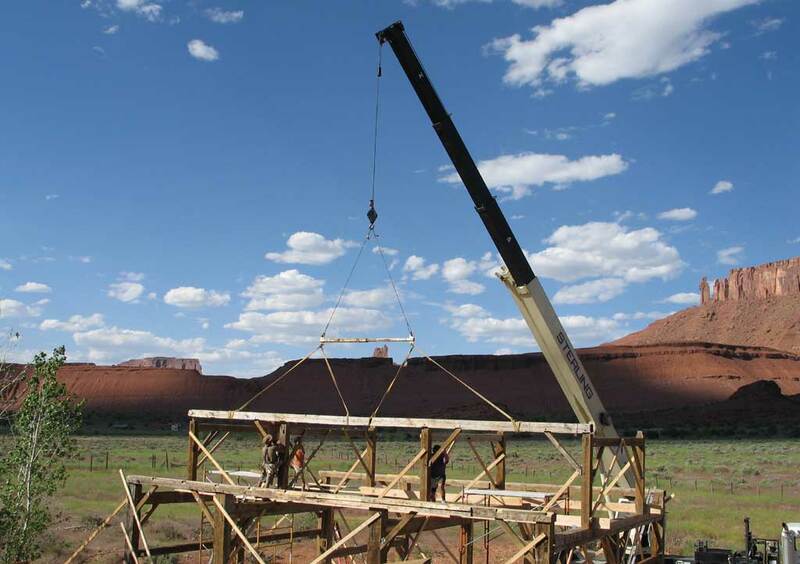 Day 7: After an abbreviated driving tour of eastern Utah this morning, the crane arrives and we are ready to go - Finally! The bents go up quickly and the building begins to take shape. Things are looking good. Next come the queen posts, which sit on top of the bents and hold up the rafters. These go in nicely without problem. Finally for today the 40 foot purlin beams are set on top of the queen posts. We all are amazed that people used to put these buildings together without the help of a crane! 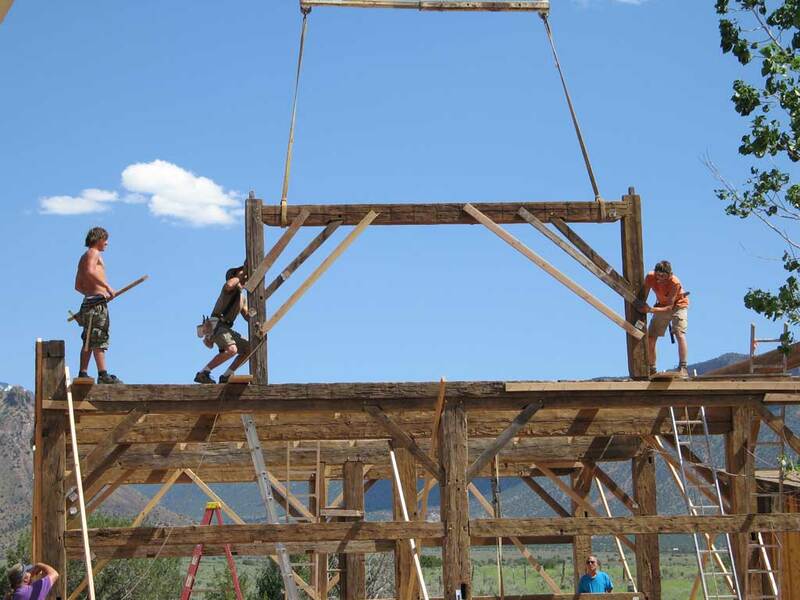 Tomorrow the crew will adjust the frame and prepare for the crane to return and place the floor joists and rafters. Stay tuned! 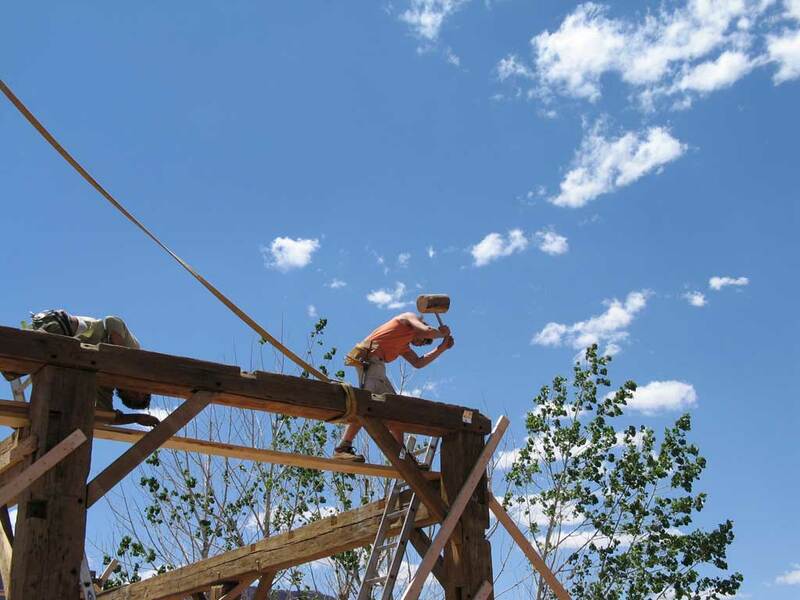 Next the 40 foot tie beams are set on top to hold the four bents together. It is a bit tricky to get everything to line up and go together. After a bit of trimming and adjusting, Sheldon applies "the persuader" and the beam settles nicely into place. Day 9: After a day of adjustments and cutting the floor joists to fit, the crane arrives (early, even!) to set the floor joists and rafters. 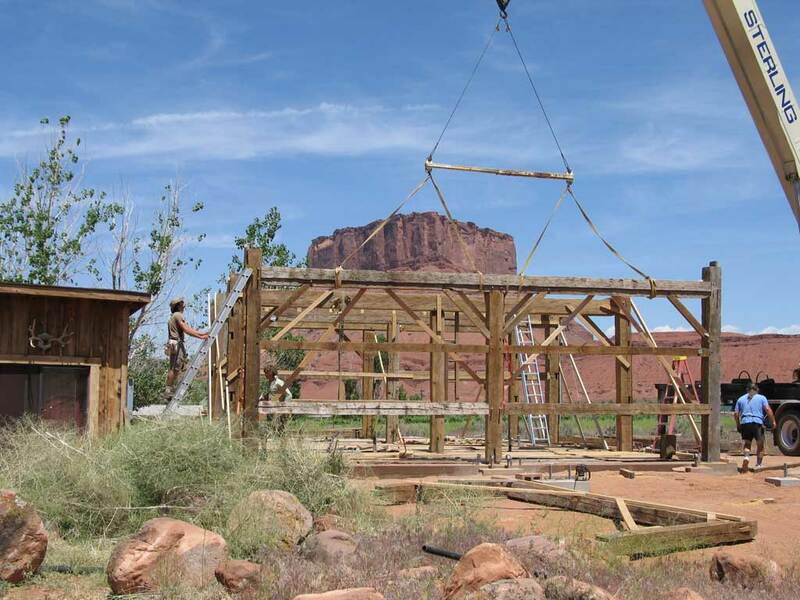 All goes smoothly, and by the end of the day our barn frame is up and ready for action. Many thanks to Dale Lehmer of Antique Woods and his crew: Josiah, Sheldon, and Greg. Great Job!